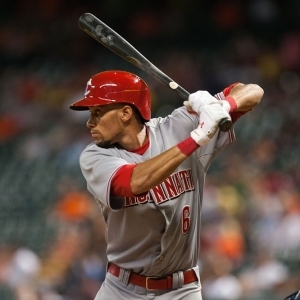 The Cincinnati Reds welcome the Chicago Cubs to Great American Ball Park on Tuesday. The probable starters are Dan Haren for the Cubs and Joshua Smith for the Reds. The opening line for this matchup has Chicago at -129 and Cincinnati at +119. The over/under was set at 8.5. The Cubs have a 69-77 over/under record and a 76-79 run line mark, meaning they cover 49% of the time. The Reds have a 80-69 over/under record and a 78-76 run line mark, which means they are covering the spread 51% of the time. The Cubs come into this game with a 90-65 record, and they are 42-33 away from home. Dan Haren has a 9-9 record on the season, an earned run average of 3.83 and a 1.18 WHIP. He's pitched 174 innings thus far while surrendering 168 hits over that time and when he starts, the Cubs are 15-15. Their record against the over/under when he starts is 18-11. His teammates are averaging 4.4 runs a game when he pitches. The bullpen's earned run average is currently 3.46 and they've given up 437 hits on the season. Opposing teams are hitting .232 against the Cubs bullpen while walking 177 times and striking out 490 times. Chicago is averaging 8.79 strikeouts per game while getting 8.02 hits per nine innings as a team. They rank 4th in baseball in team earned run average at 3.49. Chicago ranks 29th in the league in team batting average at .244 while hitting .250 on the road. Ranked at 14th in the league in on-base percentage, the Cubs sit at .321 and they hold a .399 team slugging percentage. Anthony Rizzo leads the team in hits with 156 while the team ranks 28th in baseball with 8.26 hits per game. With a 63-92 overall record, Cincinnati will come into this game 34-44 at home. Joshua Smith has a record of 0-2 while sporting an earned run average of 7.23 on the year with a 1.90 WHIP. He's pitched 23.2 innings thus far while surrendering 29 hits over that time in which the Reds are 1-4. Their record against the over/under when he starts is 5-0. His teammates score an average of 4.8 runs a game when he pitches. The bullpen's earned run average is currently at 3.99 and they have given up 484 hits on the season. Opposing teams are hitting .240 against the Reds bullpen while walking 221 times and striking out 466 times. Cincinnati is averaging 7.61 strikeouts per game while getting 8.86 hits per nine innings as a team. They rank 24th in the league in team earned run average at 4.33. They rank 20th in the league in team batting average with a .251 average while hitting .257 at home. Ranked at 16th in the league in on-base percentage, the Reds sit at .316 and they hold a .400 team slugging percentage. Brandon Phillips leads the team in hits with 166 while the team ranks 15th in baseball with 8.63 hits a game. The Cubs have committed 105 errors and have combined for 1,597 assists and 4,189 put outs leading to a .982 team fielding percentage. The Reds have committed 85 errors on the season with 1,570 assists and 4,170 put outs leading to a team fielding percentage of .985 on the year.